Last edited by Leander; 11th March 2019 at 03:18 PM. Welcome to SHAKES & FIDGET, a fantastic fantasy RPG set in a world of fantasy! You do not have to download any software but you can play the game right away in the browser of your choice, on Steam or on your Android or iOS device. The game is completely free to play and even ad-free if you disable the Flying Tube (in-game ad videos to gain Lucky Coins). Shakes & Fidget's development, support and server costs are funded through the in-game currency of Mushrooms ( ). You can buy them in-game to progress faster in less time. For example, you can get additional Thirst for Adventure to complete more Quests every day, spend them on items or skip the Countdown Timer in the Arena or in Dungeons. Wanna read the latest Shakes & Fidget news and learn more about new content, worlds and events? Follow us on Facebook, Twitter and Instagram! What would a fantasy world jammed with monsters, dungeons, NPCs and lots of gold (everybody loves gold!) be without heroes? Now it's your turn to explore the wonderful but at times cruel world of Shakes & Fidget. Choose your class, choose your destiny and start your legacy! The registration screen shows a selection of hero Classes: a Warrior, Mage, Scout, Assassin, Battle Mage and Berserker, each with strengths and weaknesses. Click a Class to display them! Warrior: a heavily-armored tank with one weapon, usually a sword or an axe. Shield: 25% chance to block. Armor: 50% Damage Reduction. Mage: a damage dealer with a magic wand. Armor: 10% Damage Reduction. A Mage's attacks cannot be evaded or blocked. Scout: a swift hunter. Reflexes: 50% chance to evade. Armor: 25% Damage Reduction. Assassin: a sneaky Class with two Warrior weapons. Strikes twice. Reflexes: 50% chance to evade. Armor: 25% Damage Reduction. Repels Fireballs. Battle Mage: an armored Mage with a Warrior weapon. Fireball attack before the actual fight, Opponent loses up to 33% of Hit Points. Magic shield: 40% Damage Reduction. Armor: 10% Damage Reduction. Repels Fireballs. Berserker: wears Warrior equipment but does not have a shield. Rage skill: gets an immediate additional attack with a 50% chance each. Armor: 25% Damage Reduction. Prone to Mages, suffering +100% more damage from them. Please note that some of the chances are the maxed out ones. You start with less. 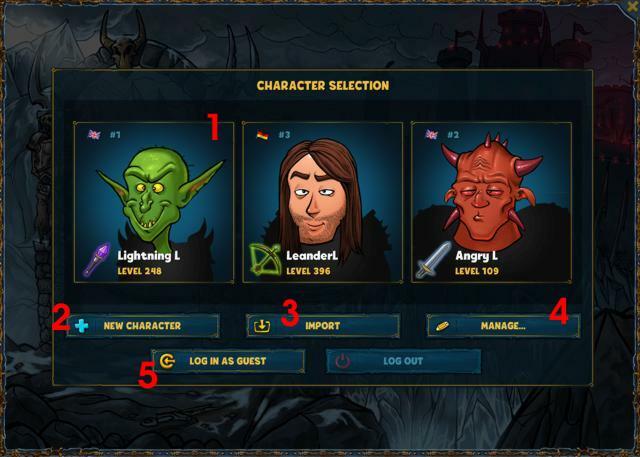 Pick your Class and click the continue button! 1: Now select your Race. Just like the Class every Race has its strengths and weaknesses too. These starting bonuses are not that important so rather pick what looks or fantasy lore you like best. 2: Select your gender. Next, either click the die icon to use random looks or click the pencil to customize how your alter ego should look like. 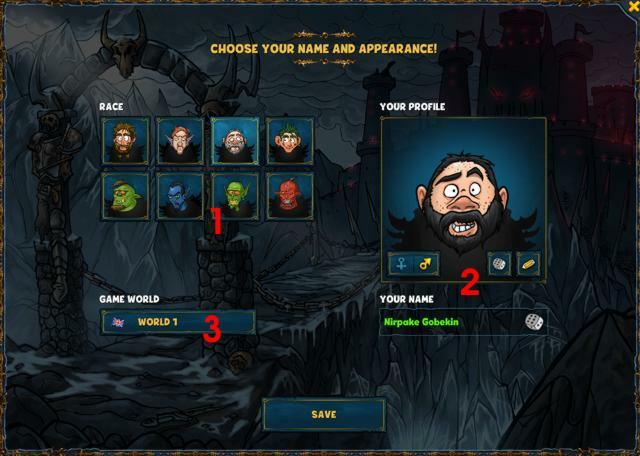 Enter the name of your hero or click the die to use a random name. Hint: you can change your looks later on so it does not have to be perfect. 1: Your list of heroes. Play as many as you would like but please note that each of them must be on a different server. 2: Click this button to create a new hero. 3: Import existing heroes and add them to Account Management. 4: Here you can change the order your heroes are displayed and delete heroes from Account Management or from the entire game. Warning: cannot be undone! 5: Wanna play a Character without storing login data? A friend wants to log in on your device? Click "Log in as guest". When creating a new hero you play right away without having to enter an email address and password. Only at level 10 will you be prompted to validate your account. This should make the start of the game easier for new players. Both in Account Management and the game a red exclamation mark next to your hero reminds you you haven't secured your account yet. 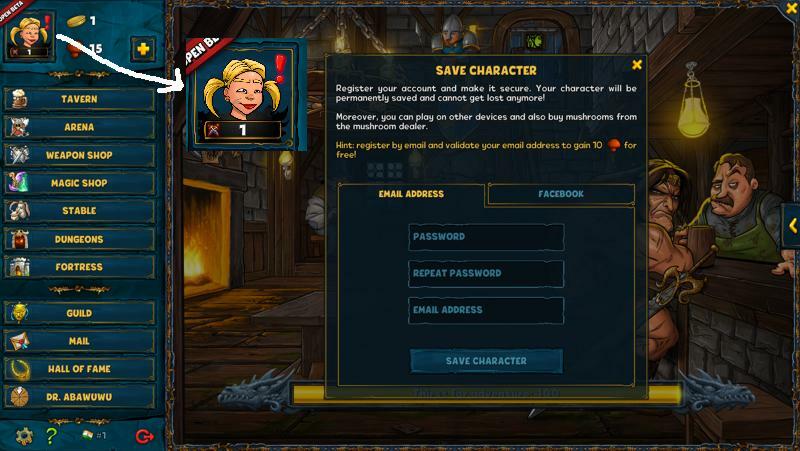 If you would like to validate your account earlier or do something that requires a validated account (for example buying Mushrooms), click the bottom-left gear icon/Game Options or the red exclamation mark next to your Avatar, enter your email address and a password (or use Facebook) and select “Save character”. Last edited by Leander; 27th February 2019 at 01:43 PM. In additon to mouse or touchscreen you can also play the game with your keyboard. Press a key once to display the first screen or press it multiple times to switch to other screen. 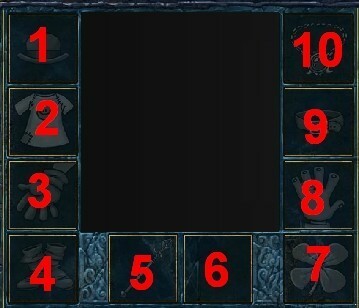 For example, H three times to display the Fortress Hall of Fame. Please note that certain screens require a certain level and are only unlocked after reaching it. For example, spamming the K button to visit your little Pets does not work until you actually have Pets. A newly created Level 1 hero doesn't have access to the whole content of Shakes & Fidget yet. Level up to unlock more and more features! Last edited by Leander; 26th October 2018 at 04:53 PM. After reading the introduction and creating your account it's time to actually PLAY the game! Here it starts...in the tavern! I can't think of a better place! Chatter, drink and rest, then start the next quest! 1: Thirst for Adventure. This is your endurance bar which displays how many Quests you can do today as every Quest costs TfA points. The bar refreshes once a day at midnight (depending on your server). 2: The Quest giver offers you three Quests. 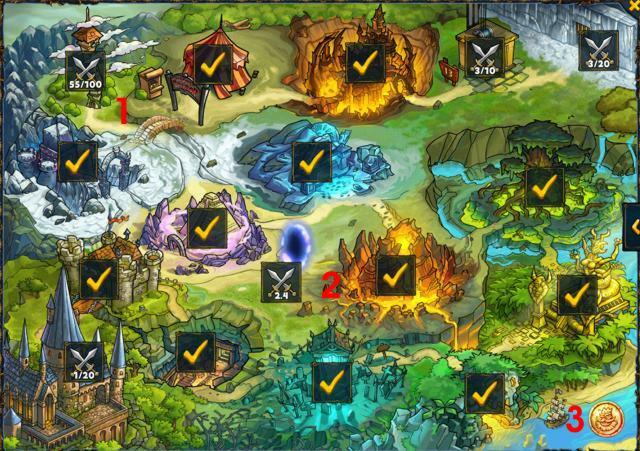 Select one of them to gain XP, Gold, Honor and sometimes an Item, a Mushroom or other rewards. Every Quest reduces your Thirst for Adventure depending on the Quest duration. Want to travel faster? 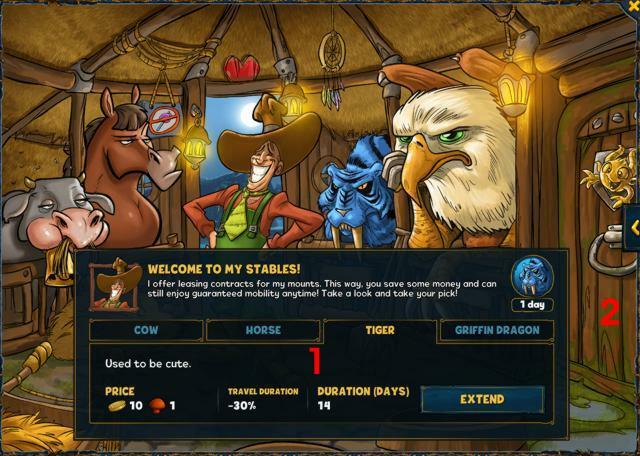 Visit the Stable and lease a Mount. 3: Click the Barkeeper to drink Beers, up to 11 a day. By doing so you can use up to 300 Thirst for Adventure instead of the default 100. Moreover, the Barkeeper also tells you if there is a Weekend Event. 4: Visit the Gambler to play a game of luck and win or lose Gold and Mushrooms. Use the sliders to place your bet or open the chat and enter /gold bet x or /mushroom bet x to bet an amount of x. 5: Daily Missions! Too tired, too lazy or too busy? We don't care. There's always more to do! 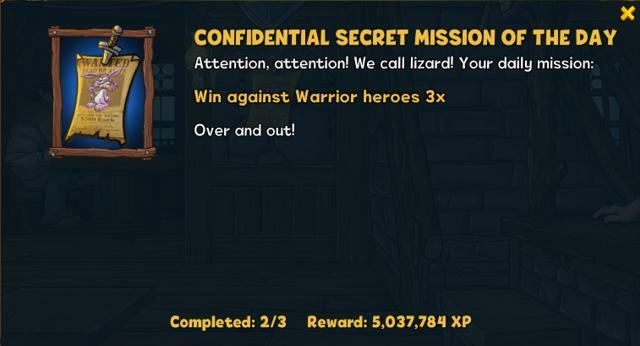 Click the wanted poster to check out your Daily Mission. Complete it for some extra XP! Level 10 required. Not available during Weekend Events. 6: Go upstairs to visit the Arcane Toilet. Level 100 required. 7: City Guard. Monster slayer, treasure hunter...still in need of Gold? 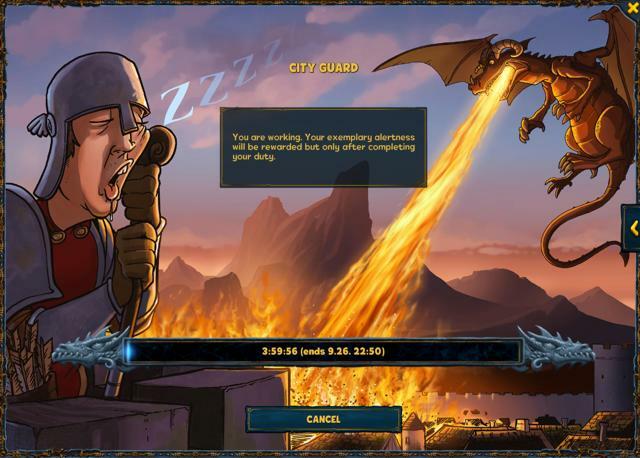 Get a new job and work as a City Guard! Hint: red Quests are more difficult but the rewards a better. 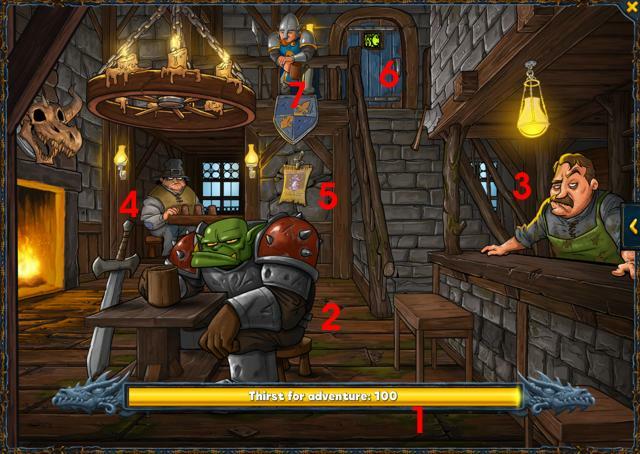 Hint: during Happy Hour you can spend 1 to skip the Countdown Timer of a Quest. Some servers have Happy Hour between 11 pm and midnight whereas others have it all day long. Hint: if your Backpack is full you cannot get an Item as Quest reward. 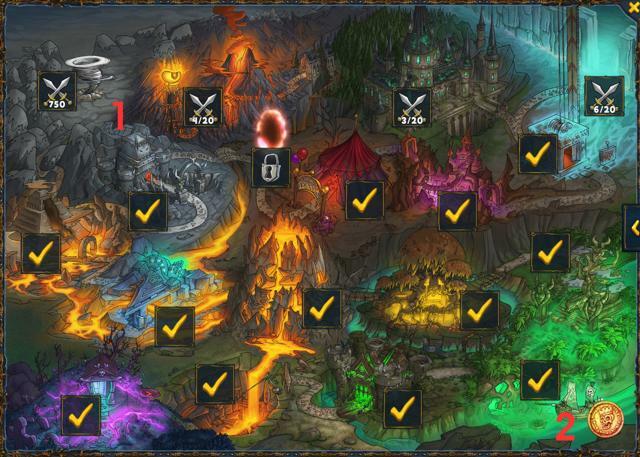 Hint: every completed Quest rewards you with 10 Honor. Use the slider to set how many hours you would like to work! You have to complete your job though. Tell them five hours are ok, then stop after two? No way! Get even more Gold during our Gold Events. We have them every few weeks on Saturday and Sunday. Important: your work has to end on Sunday (server time, not your local time!) to get the extra gold bonus! If it ends on Monday you only get the normal reward. What's more epic and heroic than spending time in a Tavern Toilet? 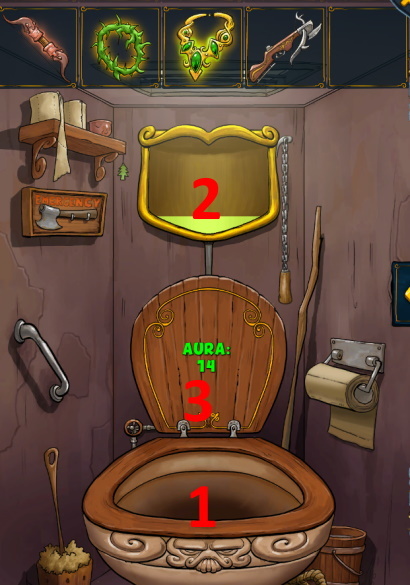 If your level is 100 or higher and you've already found the Toilet Key on your Quests you can click the Toilet window in tavern and enter the Arcane Toilet. Most heroes usually hoard tons of useless things in their Backpacks and the best place for their stuff is...the Toilet. You can sacrifice Items to the Gods by throwing them in the Arcane Toilet. As a result, the Toilet's Mana Tank increases once per day. Hover your mouse over the Tank to display the amount of mana points required to flush the Toilet. As soon as the Mana Tank is full, you can pull the chain to flush the Toilet and receive a new random Item or even one of the special Toilet epics. In addition, your Aura increases by 1, up to level 66. 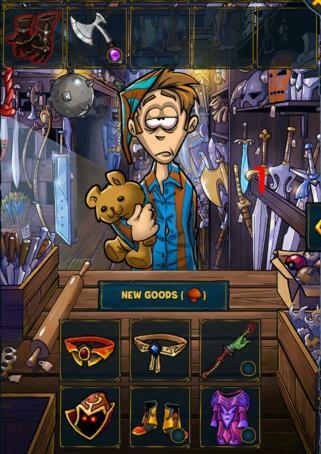 Aura improves your reputation in the Shops: the higher your Aura, the better Items you are offered by the merchants. Although the Toilet's Mana Tank increases only once per day you can still sacrifice any number of Items. The Gods are merciful and they immediately give an Item back for each sacrifice they receive. Such Items are not generated for your Class but for your Followers in the Tower because the Gods have a heart of Gold for these little helpers. Hint: once an Item has been in the Toilet you cannot sell it anymore. The Blacksmith will still dismantle it though. He just doesn't care. Hint: if you sacrifice an Item and receive both Mana Points and a new Item, you don't get Mana Points for the new Item the next day again! Hint: the Gods prefer Epic Items! Standard Item: 25 Mana points, Epic Item: 50 points, Potions: 10 points. The points required to flush the Toilet increase with each flush. Hint: if a sacrifice exceeds the Mana Tank's current maximum the remaining points are lost. Last edited by Leander; 7th October 2018 at 09:59 PM. Mercyless one on one battles for honor! Show the world how strong you really are! Enter the Arena to fight against other players. Select one of three suggestions and accept the challenge in the popup window. If you win you are rewarded with Honor and Gold (and even XP, up to ten times a day). Moreover, you also get Scrapbook stickers of your Opponent's Items if you don't already have them. You can manually choose any Opponent in the Hall of Fame but with no XP reward. You can save fights by ticking the box in the fight window. You can watch saved fights again in the Battles tab of your Mail. Hint: an Arena fight is free every 10 minutes. If you are that kind of brawler and feel the urge to cause some more trouble you need 1 for each additional fight. Hint: if the Honor gap between you and your Opponent is too high you won't win or lose anything. Last edited by Leander; 2nd October 2018 at 12:27 AM. Wandering in the wilderness naked is definitely back to nature but not recommended. Every hero needs good equipment! As you can't loot it all merchants come in handy. 1: The Obscure Pommel that opens a shortcut to the Blacksmith. Visit the Weapon Shop to buy weapons, hats, breastplates and shoes. They are randomly generated based on your Level and Aura (Arcane Toilet). Use drag and drop gestures or the right mouse button to buy, sell, equip and unequip Items. The Shop is refreshed once a day. You can also spend 1 to immediately get new Goods. You can also sell Items but keep in mind that sold Items will be lost and cannot be restored! 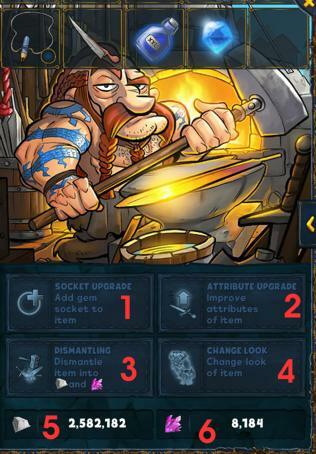 Visit the Blacksmith and ask him to upgrade, modify or simply destroy your Items. You unlock him at Level 90 but of course only heroes with Pets can enter the smithy. That makes sense, right? The Blacksmith has a total of four actions that either cost or give you Metal and Arcane Resources. Use a drag and drop gesture or the right mouse button to use them. 1: Socket upgrade: adds a Gem Socket to any Items but Warrior shields. 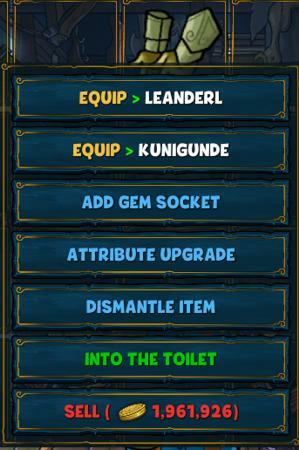 2: Attribute upgrade: you can improve an Item up to 20 times. How many times an Item has already been improved is displayed in the popup when you hover your mouse over the Item. 3: Dismantling: dismantles (and destroys) an Item into a random number of Metal and Arcane Resources. This action can be used up to five times a day. 4: Gem extraction: extracts the Gem from a Socketed Item and destroys the Item. The Gem is sent to your Backpack , ready to be used in a different Item. 5: Your Metal Resources. Rock on! Hint: you gain a good amount of Metal and Arcance resources for selling upgraded Items in the Shops! Don't dismantle upgraded Items but sell them! Last edited by Leander; 28th September 2018 at 01:43 PM. You can't learn any spells here but trade your hard-earned Gold for equipment and well-brewed potions. Drink them at your own risk...just kidding, they taste wonderful and boost your hero! Visit the Magic Shop to buy rings, amulets, lucky charms and Potions. They are randomly generated based on your Level and Aura (Arcane Toilet). Use drag and drop gestures or the right mouse button to buy, sell, equip and unequip Items. Deep in the dark woods there lives a witch, visit her poor or rich, she will enchant your gear, make you stronger, without fear! That wasn't correct as she actually lives in the Magic Shop! Hover your mouse over the Cauldron to display the Ingredients needed every day (3) and how many of them have already been provided. The requirements are indicated in points. Don't worry! 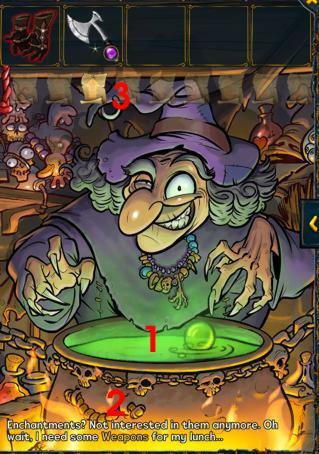 The indicated amount the Witch needs is the combined goal of all players in your world. When the required amount has been reached the Witch is ready to start her ritual. She needs 24 hours to complete a Spell Scroll. Use the Spell Scrolls to enchant your Items with different bonuses. Hint: when used as ingredients, Epic Items add the same number of points as normal ones. Hint: every Item can be enchanted only once. Hint: the enchantment bonuses only affect your Character but not your Tower Companions! However, there are two exceptions: the scrolls "Sword of Vengeance" and "Shadow of the Cowboy" can be used by your Companions as well! Hint: the more Spell Scrolls have been unlocked, the higher the effect of the Arcane Toilet's Aura! 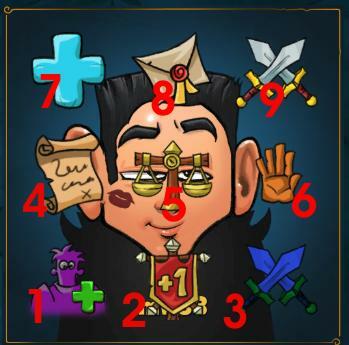 Up to a x3 bonus if all 9 Spell Scrolls haven been unlocked! Q What does the Witch do? A She brews Spell Scrolls in her cauldron. She needs Ingredients in order to complete her ritual. Once complete (=the cauldron shows 100%), a random Spell Scroll becomes available. 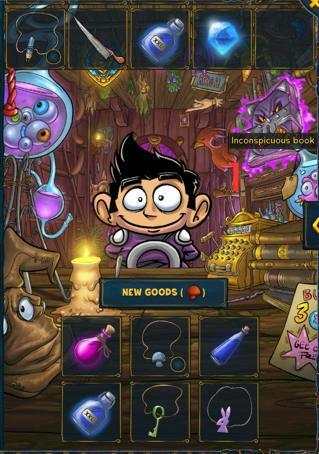 You can directly buy it here: Magic Shop -> Inconspicous book -> click on the Scroll you would like to buy and the equipped Item the Scroll matches will be automatically enchanted with it. Q What does the Witch need for her ritual? A She needs many ingredients. The type of ingredients changes every day and it resets at midnight. For example, on day 1 she needs belts, on day 2 she needs rings, on day 3 she needs weapons. Note: the progress of the Cauldron does not reset! Of course the goal of 100% does not have to be reached in only one day. The Cauldron only resets once the ritual is complete and a new Spell Scroll is available. A Take a look! She needs all types of items except shields! 6) Shields: only warriors have shields! The witch never needs shields! Q How many Items should I donate? A As many as possible. The more Items you donate, the faster the Witch will complete her ritual. Q What should I throw in the Cauldron? And what's not recommended? A Good: normal Items of the type she needs. Not recommended: Epic Items. It's possible to donate them but they only count as normal ones. Q Am I obliged to donate Items? What is my reward? A You do not have to donate Items but it is highly recommended. The goal will be reached more quickly if a lot of players donate a lot of Items. The reward is the Spell Scroll...but it will become available to all players, no matter if they donated Items or not. Note: you get some Gold for throwing an Item in the Cauldron! The Witch is even more generous than the Shopkeepers as you gain twice as much :Gold: from her! Exception: Arcane Toilet Items. Q The Witch needs different Ingredients on different servers and the progress is different? A Yes, it's random what the Witch needs every day. The goal is to reach 100%. The point total needed to complete the ritual varies from server to server. It depends on the number of active players. If a server has fewer active users the point total is lower and a single donated Item adds more points. It does not matter if the server is an old or new one as everything is still fair and balanced due to the percentual goal. Q The Cauldron has reached 100%. What now? A A Spell Scroll is unlocked. It costs only and no . Q What's the purpose of a Spell scroll? A Enchant 1 Item your character has currently equipped with 1 Spell Scroll. There are 9 different types of Spells - one type for each Item type. If the Spell is a weapon Spell you can only enchant your weapon with it. Using it is final so it is not possible to disenchant the Item. The enchanted Item adds a bonus but it does not increase your Character Attributes. It is not possible to enchant an Item twice. Note: you can also enchant Epic Items! Q What about the Arcane Toilet and the Tower? A It is possible to throw enchanted Items in the Toilet. Your Companions in the Tower are able to wear enchanted Items but the bonus will have no effect. Q All Spell Scrolls have been unlocked. Should I still visit the Witch? A Of course! Remember that you get twice as much from her than you would for selling an Item in the Shops! Enchant your breastplate to find Mushrooms on Quests more often. Enchant your footwear to shorten your traveling time on Quests. Enchant your gloves to draw first in battle more often. The hero with the highest reaction score starts. Enchant your hat to earn some extra XP for Quests. Enchant your amulet to find Items as Quest rewards more often. Enchant your ring to find extra Gold on quests. Last edited by Leander; 21st January 2019 at 04:58 PM. Don't want to walk? - Get yourself a mount! It will reduce the amount of time it takes to complete a quest! 2: Door to your Pets. Can only be accessed at level 75+. Hint: You can replace an already leased Mount with a faster one but the old Mount will be lost! Hint: The Mount selection varies for the two factions but costs and stats are the same. Hint: The "environmental reward" can only be collected once. Pets enrich our lives! What would we do without those little fellas that are soft, cuddly and make poo poo day by day? 2: Your Pets. Gray out: Pet unlocked but not found yet. Question mark: not unlocked yet. 3: Feed your Pets with different kinds of fruits. 4: The Attributes and Class of a Pet. 5: The Habitat of the selected Element. Click the Habitat button to fight in the Habitat and unlock new Pets. 6: Pet fights against other players. Pets are divided into 5 elements and colors: Shadow (pink), Light (yellow), Earth (green), Fire (red) and Water (blue), with 20 pets each (14 common, 4 rare and 2 Epic ones). If you are level 75+, you can find a nest with precious eggs on every quest that does not have an Item reward displayed. The nest contains 5 Pets out of the total of 100 creatures. At first, you do not know much about these strange creatures. Therefore, you are familiar with only 3 per Element, which means you can only find those as Quest rewards. If you want to find and collect more Pets, you have to defeat them in Habitat fights. The Pets of each element live in a special Habitat. Pick one of the Pets you already own and send it into battle! Bear in mind that every Pet has different Attributes, Levels and Classes (Warrior, Mage, Scout) and has certain advantages over and disadvantages against its Opponents. 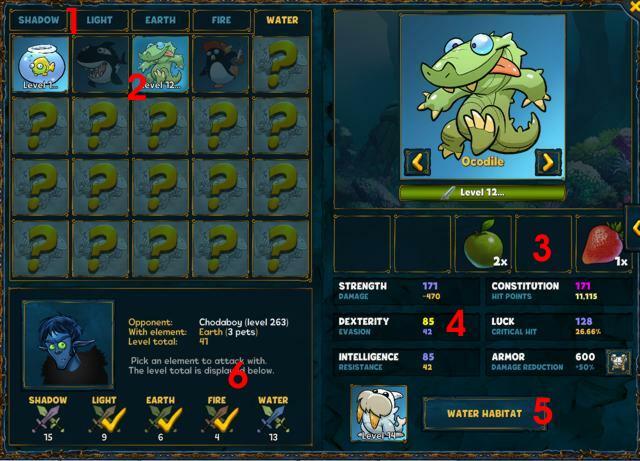 Defeat a Pet in a Habitat fight to unlock it and gain XP, Gold and Pet food (a fruit) for the Element you just defeated. Hint: You can start a Habitat fight once an hour. Habitat fights use the Dungeon and Tower countdown timer. The more Pets of an element you have, the better they feel among their own kind. Every Pet in a pack raises all of their attributes by +5%. You can find Pet food (fruits) on Tavern Quests (unless an Item reward is displayed), for winning Habitat fights or from Dr. Abawuwu's Fortune Apparatus (Level 95+). Every Pet of an Element has its favorite food (3) it can be raised and upgraded with - up to level 200. Feeding Pets works like drinking Potions (drag and drop gesture or right mouse button). You can feed a Pet up to three times a day. Dots next to displayed Level indicate the Pet's hunger. If the creature is not hungry anymore, the Level will be grayed out. Please note that you can only feed a Pet up to level 100 if you haven't unlocked all Pets yet! Every Element consists of 20 Pets. You start the game with a knowledge of 3 of them. The further you venture into a Habitat (5), the more native creatures you discover. Keep in mind that a common upgraded starter Pet might be less strong than a Level 1-Pet of the same Element you unlock later in the game. Click one of the sword icons to tell your Pets to attack the Pets of other players in the game. Your whole pack of a certain color will attack the whole pack of your Opponent then. Every day you are matched against a random Opponent and Element. You have to decide which of your packs you want to send into battle. Choose wisely! Certain Elements have the edge over others. Shadow is effective against Water, Light repulses Shadow, Earth fends off Light, Fire has a bonus against Earth, Water is good for fighting Fire. The screenshot (6) shows the Opponent's Element and your Pets' Level total. You can use every pack/Element only once a day, which limits battles to 5 a day. Defeat another player's pack to gain Honor and win a Fruit for the color you just defeated. If your attack is not successful, you lose Honor in the Hall of Fame for Pets. If you are the defender you can only win or lose Honor but gain no Fruit reward. Hint: You can send your Pets into battle every 15 minutes or use 1 Mushroom. What is the benefit of Pets apart from being cuddly? The 100 Habitat fights give you Gold and XP. Moreover, the packs boost your hero's respective Attributes by +1% per Pet. Moreover, if a pet reaches Level 100 you get an additional bonus of +0.5%. The bonus is increased to +0.75% at Level 150 and even +1% at Level 200. Last edited by Leander; 17th December 2018 at 04:37 PM. What would a RPG be without dungeon? Dark dungeons? Deep dreadful dungeons of death and doom? And despaaaaaair? Face your fear and enter the unknown depth of a forgotten tomb for love and light? No, for lots of loot! 1: The world map is full of Dungeons and the fairy-tale Tower! 3: Click the medal to switch between Light and Shadow World. When can I get a Dungeon Key? * from Level x on. Sometimes it takes a little longer, especially for Keys 6 and 9! How do I know I will get a Key for completing a Quest? The Key is shown as a reward for the Quest (similar to standard Items). What if I sell a Key? Don't worry, it does not matter. You can find the Key again until you use it to open the Dungeon. What if I lose a Quest with a Key as reward? It does not matter. You will find the Key again. Do I have to clear a Dungeon to get the next Key? No. You can open multiple Dungeons without having to complete some of them first. Some are an exception though, please read the list above. Keys are randomly generated. Sometimes you can have a character with level 30 for example and you still haven't found the key to the second dungeon yet (although you can find it from level 20 on). It is pure chance...either luck or bad luck. Be patient and keep waiting, you will definitely get your key. What Loot do I get for defeating a Dungeon Monster? The Monsters drop XP and or an Item. If you win an Item it is either a normal Item (50% chance) or an Epic Item (50% chance). Only the last Monster of a Dungeon drops a guaranteed Epic Item! Can I complete a dungeon again? No. You cannot enter it a second time. You defeated all the Monsters anyway. Remember all those fairy tales you were afraid when you were a little kid? Now relive them all! You are not alone as three fellow heroes join your quest for glory. 1: Your three Companions, a Warrior, a Scout and a Mage. They help you fight. 2: The Tower consists of 100 floors. You'll meet popular fairy tale and folklore characters. Three Companions join you on your mission to clear the Tower: the Warrior Bert, the Scout Kunigunde and the Mage Mark. They can be leveled up by clicking the + icon next to their Levels and equipped with Class-specific Items from the Arcane Toilet. Your bonus increases by 1% for each floor completed and you can find Epic Items for your Companions but not for your Class though. Hint: the Epic Items you find in the Tower cannot be sacrified in the Arcane Toilet. Moreover, you don't receive Gold for Tower Items you sell in the Shops either. Hint: your Companions' maximum Level cannot exceed your own Level! Hint: if you are an Assassin your main Attribute is Dexterity although you use Warrior weapons. However, if you hand the weapon (epics only!) to your Warrior companion dexterity will be changed to strength automatically. Moreover, the Epic gear of Battle Mages (helmet, breastplate, gloves, shoes, belt) consists of Mage Items with Strength Attributes. If you give such Epic Items to your Mage Companion Strength becomes Intelligence automatically. After reaching Level 99 you get access to the Demon's Portal (also known as the Dungeon Portal). You can enter the portal once a day to fight against an extremely dangerous Monster. It regenerates its Hit Points by 10% at midnight. Defeat a Monster to receive +1% Hit Points as a permanent bonus. For a long time nobody knew of the Shadow World's existence but it is real! You think dungeons are deadly? Get ready for someting darker and deadlier! 2: Click the medal to switch between Shadow and Light World. After unlocking the Tower and reaching Level 125 you can find the key to the Shadow World in the Gem Mine of your Fortress. The Monsters that lurk in the shadows are much stronger than normal baddies as their powers are boosted by evil shadows. Don't be afraid! Your Tower Companions will help you on your adventures in the Shadow World. To find the key to the next Shadow Dungeon you have to defeat a minimum of 5 floors of the current Shadow Dungeon (valid for Shadow Dungeons 1-14). You gain access to Shadow Dungeon 15 after reaching Level 350! You can find the key to Shadow Dungeon 16 in your Gem Mine after defeating a minimum of 5 floors of Shadow Dungeon 12. Hint: defeat a Shadow Monster and find an Epic Item for your Class or your Companions (similar to the Tower). Hint: Shadow World Epics cannot be sacrified in the Arcane Toilet. You've seen a horde of monsters in different locations and dungeons. Now imagine a giant twister with all of them coming at you again! Unlocking Shadow World will automatically unlock The Twister. Fight against 1000 random Monsters from the Light World for XP, Gold and Items! If you defeat a Monster with 90%+ Hit Points left you get a free attack (no countdown timer/ needed). Unlock special Epic Items by completing certain asks such as clearing floor 100 or 250. Once unlocked you can find them anywhere in the game. These Epic Items won't be added to your Scrabook though. Last edited by Leander; 17th December 2018 at 09:49 PM. Roaming the worlds and completing quests is great and all but returning home is also nice. You are already a well-known hero so why don't you start your own fortress with many Buildings and soldiers? 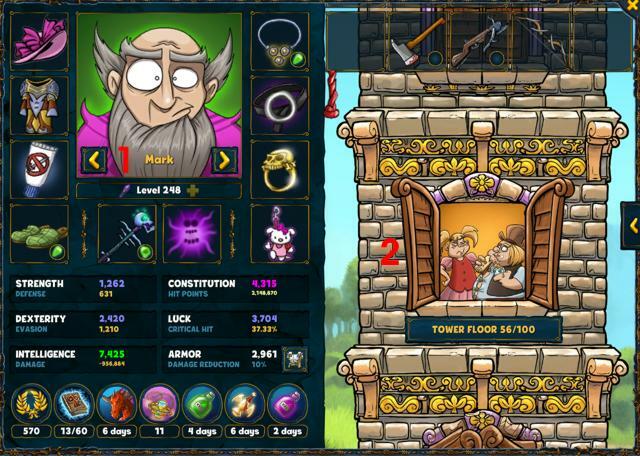 After reaching Level 25 you can start your Fortress by constructing the main Building first. Afterwards build the Woodcutter's Hut, produce some Wood and click the Quarry next. The Resources Wood and Stone are needed to build more Buildings or upgrade existing ones. Attention! Wood and Stone can be stolen during attacks. You can protect your Resources by clicking the Woodcutter's Hut or the Quarry (Resources won and lost will be explained later on). Hover your mouse over the Buildings to display the requirements and how everything works. If you have collected enough Resources to build or upgrade a Building the game will tell you with an exclamation mark and show you where you can build something. Note: you can only build one Building at a time. Fortress: upgrade your Fortress to protect more and more Resources from attacks. Maximum Level: 20. Click on the Woodcutter's Hut and the Quarry from time to time to take the Resources into your Fortress. Hall of Knights: the halls of Knights of your whole Guild work together. Every Guild member's Hall of Knights contributes 1 point per Building Level. The higher the guild total, the more precious the Gems in every Guild member's Gem Mine. Woodcutter's Hut: produces x Wood/ hour. Upgrade it to speed up the production and increase storage capacity. Attention: other players can steal your Wood from there. Quarry: produces x Stone / hour. Upgrade it to speed up the production and increase storage capacity. Attention: other players can steal your Stone from there. The Stone production is slower than the Wood production but you need less Stone than Wood in the game. Laborers' Quarters: upgrade the Quarters to speed up the construction of Buildings (and reduce the Mushroom costs if you want to finish a Building instantly). Moreover, your Laborers will find Gems faster (Gem Mine). Gem Mine: your Laborers find Gems for you and place them in your Backpack. Gems can be used to improve your Items. Items with slots can be found from Level 25 on. Moreover, the Key to Dungeon 14 can be found in the Mine, too (requirement: Dungeon 13 must be unlocked). Maximum Level of the Gem Mine: 100! Level 21+ requires a fully upgraded Level 20 Fortress. Gem Mines from Level 25 on let you search for gems while upgrading the building. Treasury: normally, you can have 5 Items in your Backpack. Need more? Build and upgrade your Treasury to get up to 15 additional slots! Academy: you can gain additional XP there. The higher the Level, the faster you gain XP. XP is based on the Building and your Character's Level. Barracks: do you want to attack other players? Then instruct your Soldiers in the Barracks. The maximum number of Soldiers is determined by the Building's upgrade Level. Fortifications: want to protect yourself against the attacks of other players? Then build Fortifications! They provide additional protection against attacks on your Fortress. Archery Guild: need more protection? Instruct some Archers there. Mages' Tower: what's better than Fortifications and Archers? Fortifications with Archers and Battle Mages! The attacking player knows whether you have Battle Mages or not but not how many as they can turn invisible. Smithy: your Soldiers, Archers and Battle Mages are not strong enough? Then upgrade your Smithy to increase the Level of your combat units. Note: several Buildings or upgrades do not only require Resources but also a minimum Fortress Level or the construction of other Buildings. All Buildings can be constructed without spending Mushrooms. Note: use the Fortress Bar (Fortress overview) to view your Resources, storage capacity and recruit Soldiers, Archers and Battle Mages or Level them up with the Smithy. Note: the Fortress Bar also serves as quick access for the Gem production. You do not need to click the Gem Mine all the time. Your Soldiers are bored? Then you better attack someone! Use the attack button to ...attack other players in range (Fortress Hall of Fame). If you do not like the target you can change Opponents every 5 minutes for free ur spend some to instantly get a new target. Before an attack the potential reward is displayed. Moreover, you also see Fortifications, Archers and Battle Mages if the Opponent has some. The exact number of Battle Mages is never known as they turn invisible. Then select the number of Soldiers you want to take part in the fight. Remember that they will not return. Attacking a Level 25 Fortress with simple Fortifications with 8 Level 30 Soldiers does not make sense. Moreover, keep in mind that the potential reward should be higher than the instruction costs of new Soldiers. A Fortress fight resembles the classic Shakes & Fidget battles. First, your Soldiers fight against the Fortifications, then they have to defeat the Archers and finally the Battle Mages. You won? Awesome! You are rewarded with some of the Opponent's Wood and Stone (will be further explained later on). All Archers and Battle Mages that are defeated in an attack are lost. You have to instruct new ones by clicking Fortress Bar icons. In addition, you also lose some of your Wood and Stone. If the attacker defeats you he/she is rewarded with 50% of your unprotected Wood and Stone (Woodcutter's Hut, Quarry). In addition, the attacker also gains 10% of your Resources that are stored in the Fortress (main Building). After an attack your Fortress is safe for 24 hours and other attackers can only steal 50% of your Resources in your Woodcutter's Hut and Quarry. You are attacked and defeated. Now you lose 50% of your Resources in the Woodcutter's Hut and Quarry - you lose 700 Wood and 400 Stone....and you lose 10% of your Resources stored in the Fortress - you lose 800 Wood and 600 Stone. The game calculates the total loss: 700 + 800 = 1500 Wood and 400 + 600 = 1000 Stone. First, the 1500 Wood is taken from the Woodcutter's Hut and completely emptied (1500 - 1600 = -100). The remaining 100 Wood is taken from the Fortress, resulting in 0 Wood (Woodcutter's Hut) and 7900 Wood (Fortress). The Quarry has 0 Stone as well, the Fortress 5800 Stone. Now your Fortress is safe for 24 hours. The Resources in your Woodcutter's Hut and Quarry can still be stolen. If you are attacked and defeated, again the attacker steals another 50% of your Woodcutter's Wood and Quarry's Stone. Please note that the calculation above only applies if both players have the same Fortress Level or if yours is lower! 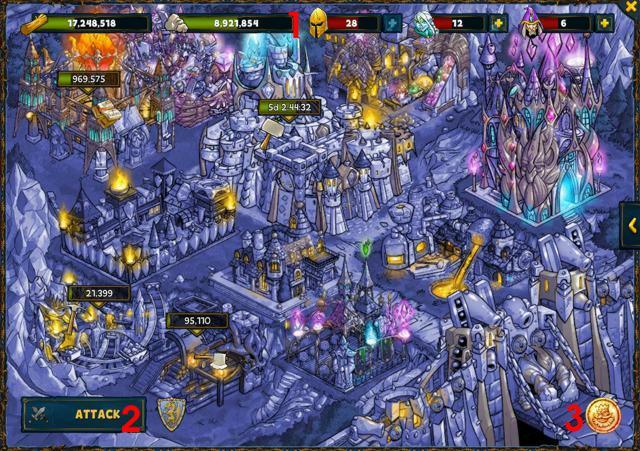 If your Fortress Level is higher the Gained resources are reduced by a certain percentage. If your Fortress Level is higher by 4 you cannot win any Resources at all! In addition to normal Loot the attacker also gets a bonus that is added by the game and not taken from the target. If the attacker's Fortress Level is equal to the target's, the attacker gets as many Wood and Stone as the target produces in 1 hour. Attacker Level higher by 1: bonus of 45 minutes. Higher by 2? Bonus of 30 minutes. Higher by 3? Bonus of 15 minutes. Bright are your fortress' surroundings but dark is the world that lies beneath. Descend into the underworld! In order to gain access to the Underworld you need the Heart of Darkness, a mysterious Gem that belongs to a horned and red-eyed reaper. This Gem can be found in the Gem Mine of your Fortress (upgrade Level 10 + access to the Tower required). The Underworld focuses on the Souls of failed and fallen heroes. Use them to upgrade your Underworld Buildings and raise your dark empire! Heart of Darkness (max. Level 15): The center of your Underworld. 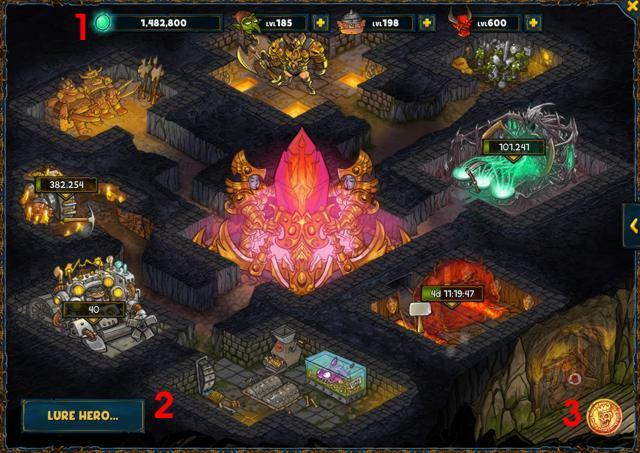 Its Level determines the maximum Level of your other Underworld Buildings. Underworld Gate (max. Level 15): You can't simply reap Souls. You need to lure heroes into the Underworld. They enter your dark empire through the Underworld Gate. The higher the upgrade Level, the more heroes you can lure every day. Soul Extractor (max. Level 15): This machine reaps the Souls of heroes that failed. The upgrade Level determines capacity and how fast Souls are reaped. Claim it regularly! Torture Chamber (max. Level 15): The higher the upgrade Level, the more Souls you can reap from heroes. Goblin Pit (max. Level 15): Goblins form the first line against invading heroes. Not strong but the more, the better. Troll Block (max. Level 15): [ "Don't feed the Troll" is not correct! If a hero defeats your Goblins, he/she faces the Trolls next. The higher the upgrade Level, the stronger and better-equipped your Trolls will become. Feed them! Keeper (max. Level 15): A true nightmare for all heroes! The Keeper destroys what is left of a hero. It is the strongest unit in your Underworld army. Wanna make it stronger? Good news: it can be upgraded! Gladiator Trainer (max. Level 15): The Gladiator trains your Character, Companions and Pets to boost your Critical Hit Damage. Sounds good? Is awesome! Gold Pit (max. Level 225): The Gold Pit produces - surprise! - Gold. Upgrade the Building for even more Gold. Remember, you're never too old for Gold! Claim it regularly! Level 16+ requires a completely upgraded Level 15-Underworld. Time Machine (max. Level 15): Time Machines don't have to be blue. This one lets you consume your unused Thirst for Adventure. It does not drink Beer though. The higher the Time Machine's upgrade Level, the more unused Thirst it can store. Moreover, the Time Machine produces a bonus of 1 Thirst per upgrade Level. All stored and produced Thirst can used be after midnight. Hint: Time Machine quests only give you Gold and XP. Hint: Weekend Events don't have an effect on the Time Machine! You can lure up to 5 clueless heroes into your Underworld every day (can be upgraded later on). Leave the dirty work to your army of Goblins, Trolls and the Keeper. Defeat heroes and reap their Souls! Either lure the hero the game picks for you or choose your victim in the Hall of Fame. Click the sword Icon to start the fight. If your army wins, every defeated hero increases the required hero Level by 1. If your army loses, the Level decreases by 5. Defeating higher Levels does not give you more Souls but defeating lower Levels decreases the amount of Souls gained. You will also get more Souls by upgrading your Torture Chamber. Hint: The hero does not lose Souls or units in his/her Underworld! 1) upgrading the unit's Building. You get more Goblins and your Trolls and Keeper get stronger. Max. Level: 600, unlimited attributes. 2) improving the units themselves (bottom bar of the Underworld). Last edited by Leander; 28th February 2019 at 03:45 PM.